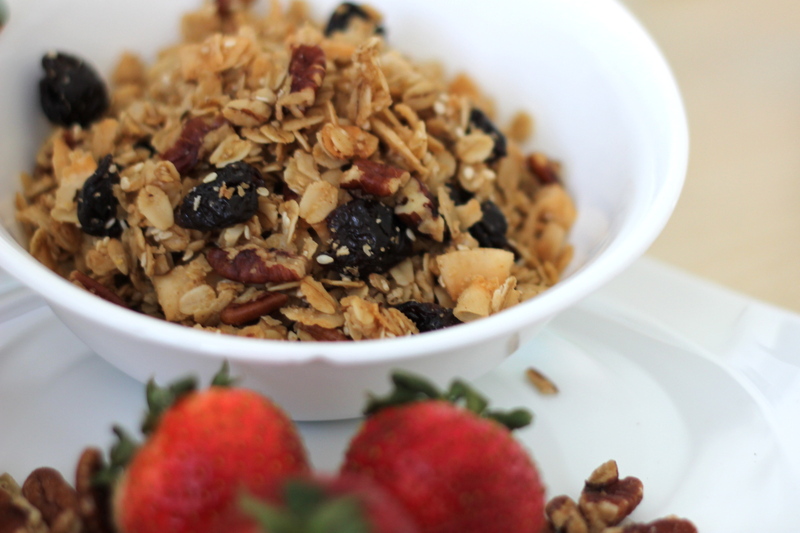 This granola reminds me of so many things, and it felt appropriate to make it today. I just returned from a quick trip to the Mitten state, where I spent pretty much every moment in the company of someone I love dearly. Ann Arbor is full of wonderful people and I could easily write a blog post about each one of them, but my grandma woke me up every morning with a homemade latte IN BED, so she kind of wins. Here’s how my mind works: I love my grandma, my grandma loves maple syrup, I have some in the fridge, along with leftover dried cherries and pecans. 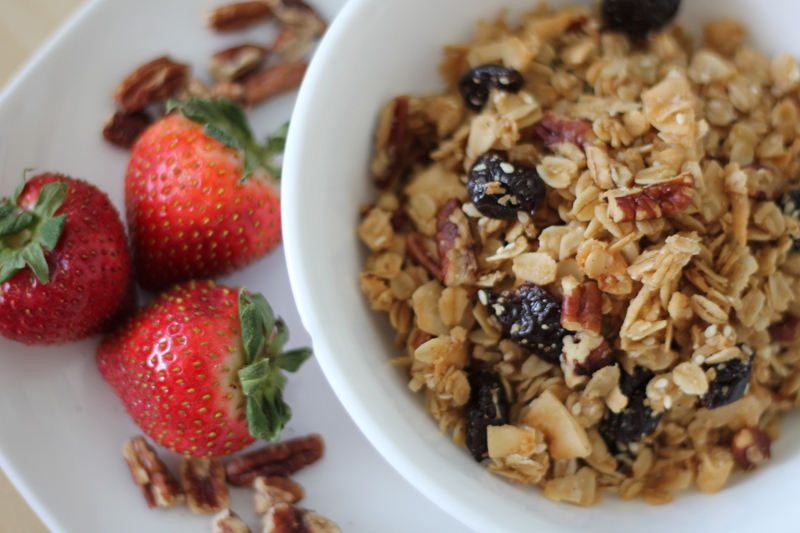 Granola time. Also granola kind of rhymes with grandma. Grandmola. You get the idea. I need to get out more. 1. Preheat your oven to 300°F. Combine all dry ingredients in your mixing bowl. Add the wet ingredients (you can just measure them all into one liquid measuring cup) and mix well until everything is uniformly combined. 2. 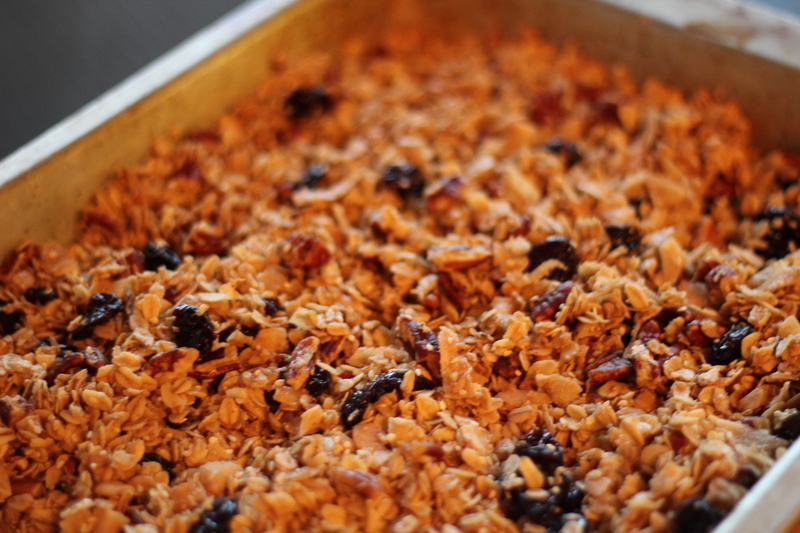 Bake your granola for 25-30 minutes, checking and stirring a bit every 10. 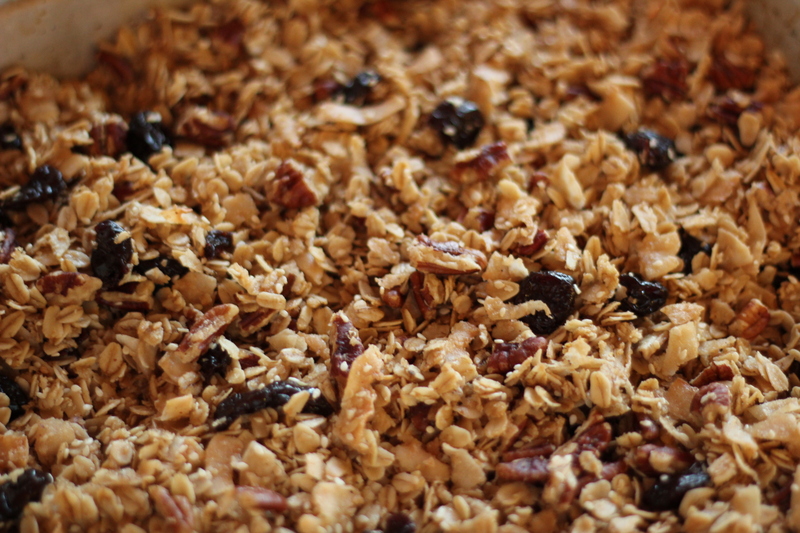 The granola will fill your kitchen (indeed, your entire home) with an unbelievably delicious smell. When everything looks pretty golden and toasty, remove the pan from the oven and stir in the cherries. Bake at most for 10 more minutes, without stirring (you may only need half this time). 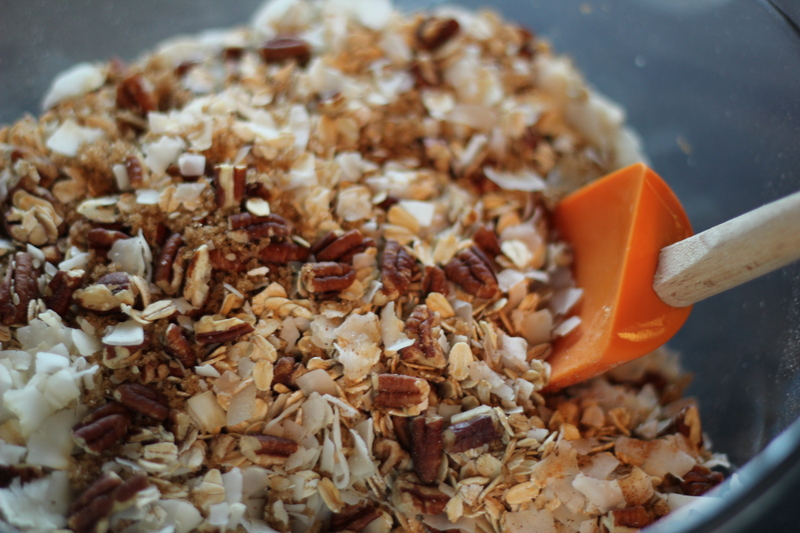 The granola near the edges of the pan will brown a bit more than the rest, so watch those for doneness. 3. Cool your pan on a rack. Do not break up the clumps; let the whole thing cool as one big piece. After about 20 minutes break it apart with your hands and store in an airtight glass jar, or, you know, eat it right out of the pan. This makes me very happy. Living at home for that year and a half after a broken heart, I spent a lot of time helping or watching my parents make granola. They’d buy a 50# bag of organic oats from the People’s Food Co-op, sesame seeds, sunnies, and a huge jar of honey from our neighbor (beautifully stored in a big glass jar with his name and address on it – the name of our road misspelled. Good job, neighbor!). My dad eats this stuff EVERY DAY, so several hours are usually consumed in the making of very large batches. Gah. this also makes me remember the one time I slept at your apartment on 3rd and you took such good care of me. I miss you, girl! you are singlehandedly making every ounce of effort i put into this blog worth it, my dear. thanks for being my friend!! When you get a chance, I need a delicious and deliciously simple recipe + cooking instructions for some big, beautiful brussel sprouts. Also, email me your snail mail address, friend. You’ll need maybe 6 tablespoons of butter per pound of sprouts. 1. Wash well, trim them and peel off the hard, outer leaves. Slice them in half from stem to end. 2. Boil a big pot of water. Salt it. Dump in the sprouts. Cook them for a minute or two, then drain them and run them under cold water. You might lose a couple leaves, don’t worry. 3. Heat some butter in a big frying pan over medium heat until the foam subsides (it’ll start to brown just a bit). Place as many sprouts as you can fit without crowding the pan too much, cut side down, and cook them for five minutes or so. Check them with a knife to see when they are done. 4. Dump the contents of the pan into a big bowl and garnish with some grinds of cracked pepper and maybe even a little parmesan. I’ll see what I can come up with. I do have a little leftover date jam I might try to work in there as well… Thanks, lady!